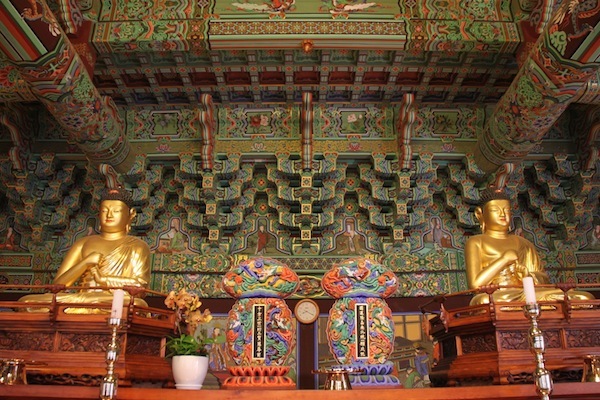 The twin Buddhas for which Daebiro Hall at Haeinsa is famous. These are described as the world’s oldest wooden Buddhas (covered in gold, obviously). HAPCHEON COUNTY, South Korea — Haeinsa is a Buddhist temple in the mountains of Hapcheon County south of Seoul. 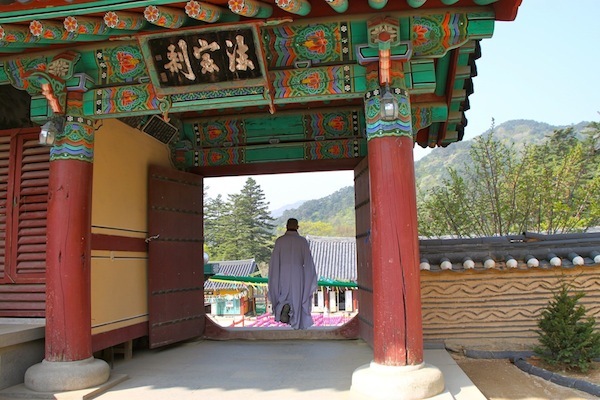 Dating from the ninth century, it is one of 16 Korean Buddhist temples where tourists can stay overnight for one or a few nights and experience aspects of a monk’s life. 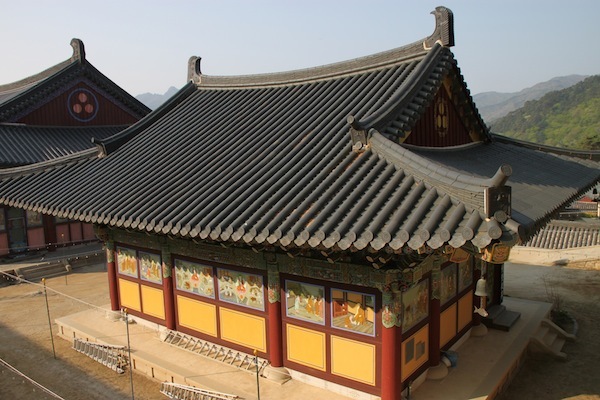 Haeinsa is different from all others, however, because it houses the Tripitaka Koreana, the world’s most complete collection of Buddhist writings, carved on 81,258 wooden blocks nearly 800 years ago. 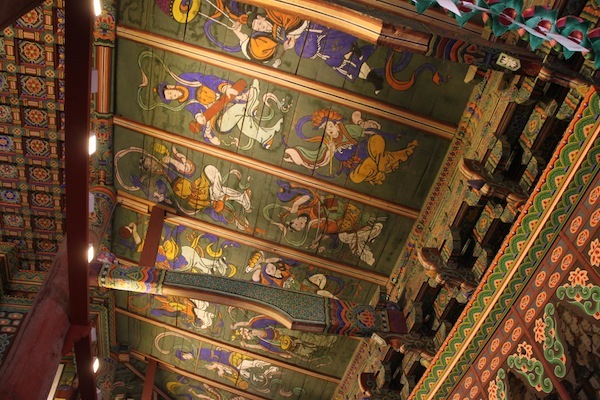 Fabulous characters painted on the ceiling inside the main hall of worship at Haeinsa Buddhist temple. I sampled the temple life for one night and glimpsed some of the Tripitaka wooden blocks while on a press trip hosted by the Korea Tourism Organization with support from the Cultural Corps of Korean Buddhism. To reach Haeinsa, we traveled by coach about five hours from Seoul, mostly on expressways, taking breaks twice at large, modern rest stops with some amusing features. 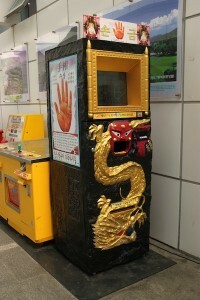 For one thing, each had a machine that for a dollar or two would read your fortune if you put your hand inside the designated opening. 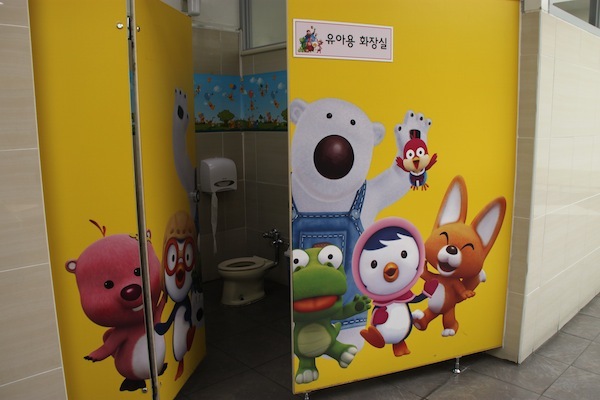 Toilet for tots, seen at a highway rest stop in Korea. get the sound of flushing to drown out other sounds. Further, one ladies room set aside a space for primping that smacked of a bordello. And the stall for tiny tots looked like a play area. Now, about the temple stay — this was an enlightening experience, but it isn’t for everyone. It helps to have an interest in Buddhism and in the promise of meditation. Otherwise, the experience may be something of a grind. On the afternoon of our arrival, our Haeinsa host, a monk called Do Moo Zee (meaning Just Don’t Know) gave us instructions on temple manners, meditation and prostration routines. Do Moo Zee leads the way through one of several gates at Haeinsa. Manners meant bowing in certain circumstances and no talking during meals in the common dining room. It often meant no indoor photos. As for meditation, we were told we would be whacked with a bamboo stick (it looked like a yardstick) if we fell asleep during meditations. Do Moo Zee demonstrated on one guest who said it felt like the whack one may get during massages. We were urged to smile slightly during meditation, as this is not meant to be a grim business; it’s meant to be the route to enlightenment. Prostration, starting from a standing position, involved going to a kneeling stance and then prostration, then standing up again, multiple times. I figure we did about 90 of those by the end of our visit the next morning. We attended evening and morning services. That morning service occurred at 3:30, which meant a wake-up knock on the door at 3 a.m. after sleeping on thin mats on the floor (blessedly heated from below). Navigating this temple, which sits on a mountain, also involved a lot of steps, but this is not true of all temples where overnight guests are welcomed. These points may make a temple stay sound unattractive, but these are things one should know before committing to the experience. The brightly painted Daebiro Hall on the grounds at Haeinsa. On the other hand, our very short visit included serious time for meditation plus group conversations with Do Moo Zee, where we could ask about Buddhism in Korea, temple life — and even his personal life. For those who stay more than one night, only the first day involves the described rigors; after that, guests decide how rigorous to be. 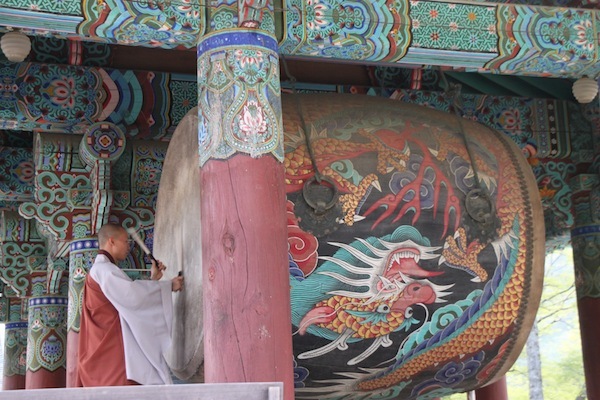 A Haeinsa monk, using a very large hanging drum, calls fellow Buddhists to an evening service. 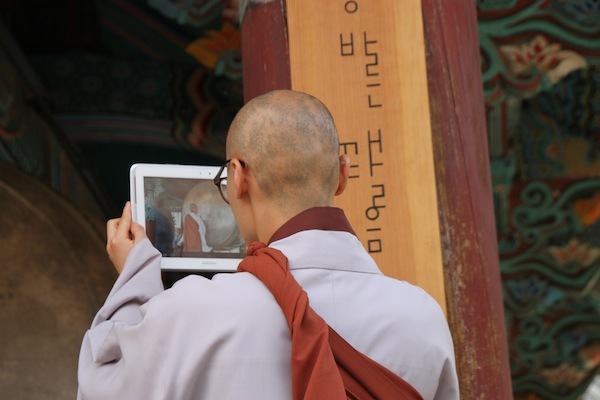 A Haeinsa monk films another who uses a drum to call fellow Buddhists to an evening service. with-it tablet, filmed the drumming session that our group witnessed. This was for training purposes, we were told. Pounding that drum wasn’t easy and required five monks working in rotation.